If you are gluten-free, you might find that rice becomes an even more important staple in your diet. I actually discovered the variety of rices out there when I tried out eating vegan for a while right after I cut out dairy (and as far as I know, my friend Cathy may still be eating all the random bits of rice I passed on to her when I moved, many years ago). With the right rice to pair with the right foods, rice becomes more than just a base for Chinese takeout. I still really do not like brown rice with “traditional” Chinese(American) style food; white rice tastes right. But brown rice with roasted veggies is fantastic, sushi rice with saucy foods, jasmine rice with delicate flavors. Rice is amazing. I can see why it’s a staple food in many parts of the world. But you may have noticed that, while I make a lot of rice dishes, my instructions for rice usually boil down to “cook it. However you can.” That’s because despite being reasonably adept in the kitchen, my sad truth is that I cannot cook rice on the stovetop. In a pot, with water, like a normal person. This is true. My first baking “experiment” was a concoction called the “Heaven and Hell Cake.” Go ahead and Google it. I found it in a USA Today while my family was on vacation in Florida, along with a story about a chef whose parents ran a diner, and his childhood conundrum: angel food cake? Or devil’s food cake? So he combined them into an 8-layer cake, alternating angel food and devil’s food, with peanut butter mousse between and a chocolate ganache over it all. Ridiculous. And also full of so very many things that I cannot now eat, so I’m glad I got a chance to try it. But standard rice? Even of the Uncle Ben’s variety in the nice orange box with very specific cooking instructions on the side? Stymied me. It was always mushy or partly cooked, or otherwise barely edible. 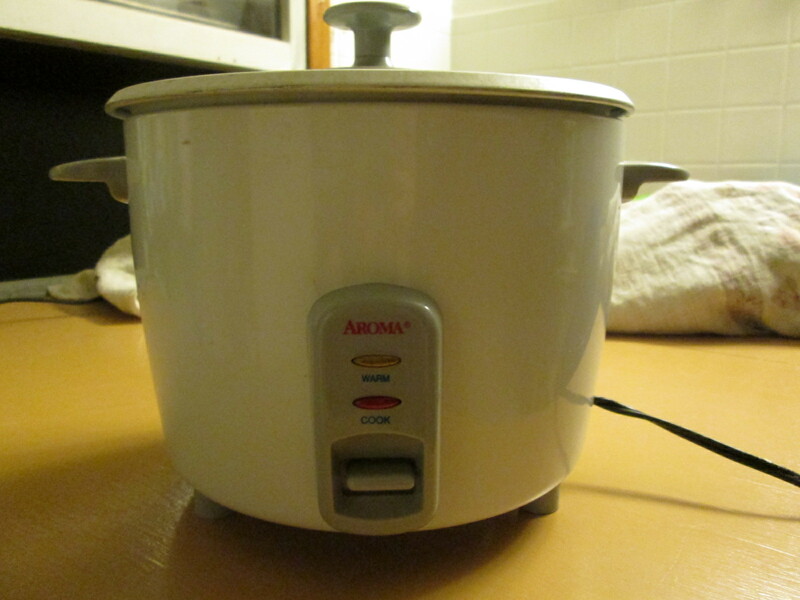 A rice cooker fixes that pretty solidly. You still need to measure the rice and the water. In my rice cooker, a spritz of oil on the bottom is necessary or it sticks pretty badly. But after that, you turn it on and let it go. It turns down to warm when it is done. Easy, right? Yeah, it still took me 6 months to get it right regularly. Rice cookers come in super-basic models which basically turn on when you plug them in, to super-fancy models that should be able to know when you’re getting home from work and have a 5-star meal on the table. When I took a Chinese cooking class from a local Chinese restauranteur in Bismarck, our instructor told us that spending a lot of money on a rice cooker was pointless (or at least unnecesary). His advice was to buy a basic cheap one, use it until it died, and then buy another. I think I’ve had this one 10 years and as long as I measure the water right, it has never failed me. I’m mostly in agreement with Alton Brown’s rants against the evils of single-use kitchen devices, but this one solves a very great need. My rice cooker not only fixes one of my basic culinary inadequacies, but it also frees me up to concentrate on the vat of stir-fry I’m making or the sushi salad veg I’m working on, or whatever else I am doing. In theory, I could also steam veggies in the basket that came with the rice cooker, but I’m not sure which box it’s in. This appliance may be a one-trick pony, but it’s a really good trick. Oh, brag on. I LOVE that rice crust, but I’ve never managed to get that without the whole pot being crusty. I’d love to figure out that skill.